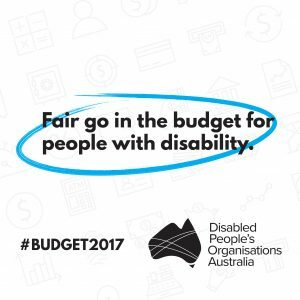 In January 2017, Disabled People’s Organisations Australia (DPO Australia) provided a submission to the The Treasury outlining our key priorities for the 2017/2018 Federal Budget. Our priorities are drawn from our collective membership, engagement and advocacy with people with disability. These priorities have been outlined in previous pre-budget submissions and in our 2016 Federal Election Platform. Much of the information in this submission has been extracted from these documents as they remain critical and relevant issues for people with disability in the context of the 2017/2018 Federal Budget. Drawing from the views of people with disability ourselves, we provide our 12 key priorities for the 2017/2018 Budget.